THE PROPERTY APPRAISER DOES NOT SEND TAX BILLS. THE PROPERTY APPRAISER DOES NOT SET OR COLLECT TAXES. The COUNTY TAX COLLECTOR (note: NOT part of our office) mailed the annual tax bills during the first week of November. Tax bills become delinquent if not paid in full before April 1 of the following year. Discounts are available for early payments. Also, you may make partial payments of your current year taxes until the March 30 statutory payment deadline. After that date, any taxes still owing become delinquent. The Property Appraiser does NOT set your tax rate nor collect the taxes. The Property Appraiser is responsible for ensuring the fair assessment (value) of all properties and applying all exemptions. Your County Commission, School Board, City Commission, Water District, and other boards set your tax rates. If you purchased a new home after January 1, 2019, you may pre-file now for tax year 2020 Homestead and other exemptions. The timely filing period for Homestead Exemption for 2020 is March 2, 2019 through March 1, 2020. The absolute deadline to LATE FILE for any 2020 exemption -- if you miss the March 1 timely filing deadline -- is September 18, 2020. State law (Sec. 196.011(8), Fla. Stat.) does not allow late filing for exemptions after this date, regardless of any good cause reason for missing the late filing deadline. Please click on the following link for more information about Homestead and other exemptions for which you may be eligible http://bcpa.net/homestead.asp. If your property has been damaged by a natural disaster, click here to let us know. If you would like to be notified about important property tax savings exemptions and classifications available to permanent Florida residents as well as upcoming Mobile Exemption and Information Team events, please click here to submit your contact information. Please click the thumbs up icon to like us on Facebook. Key Contact Info: Email Us, Call Us, Visit Us. Location: Our MAIN OFFICE is located the Broward Governmental Center at 115 South Andrews Avenue, Room 111, in downtown Fort Lauderdale (just south of Broward Boulevard). Note: Please also see our Mobile Exemption and Information Team Calendar for events held monthly throughout Broward County. Hours: We are open weekdays from 7 am until 6 pm. BRINGING CUSTOMER SERVICE TO OUR CUSTOMERS. Did you know we hold a community Mobile Exemption and Information Team session every Wednesday at 12:00 pm at Broward County Governmental Center West, located at 1 N University Drive , Plantation, in rooms 2502 B & 2503 B? Property Appraiser Marty Kiar is enhancing our office's community outreach efforts. We are constantly adding new events at condos, city halls, businesses, and other community locations throughout Broward to our online calendar of upcoming events. If you would like to have someone from our office meet with taxpayers at an upcoming meeting of your condo/homeowners or civic association, please contact Mobile Exemption and Information Team Manager Michael Clark at 954.357.6905 or . WE ARE VISITING NEIGHBORHOODS AROUND BROWARD! By state law, we must personally view each property in Broward County at least once every five years. That is why our residential appraisers are busy these days inspecting, measuring and photographing the exteriors of properties throughout Broward. Our appraisers are easy to recognize: all of them wear official shirts and bright orange vests clearly identifying them as BCPA staff, and each carries a BCPA photo identification card and badge. Feel free to ask to see an ID if you have any concerns. Important Note: Our appraisers will NEVER ask to enter your home, and we will NEVER enter locked backyards. 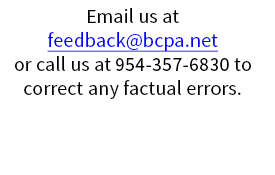 If you have questions about these inspections, please contact our office at 954.357.6831. If you have any suggestions for improving our office, please email me by clicking here.